My siblings and I can thank Grace Children's Home for our parents. For if they had not met they would not be our parents and it is highly unlikely that they would have met if not for Grace Children's Home. We can also thank Grace Children's Home for an unusual recipe for peppernuts. This one includes black pepper as one of its ingredients and uses sour cream rather than butter. We found the recipe among those my mother had saved and decided to try it. I'll be sharing the recipe with you a bit later. Grace Children's Home was basically an orphanage for they nurtured children whose parents were unable to adequately care for them and were involved in adoptions. 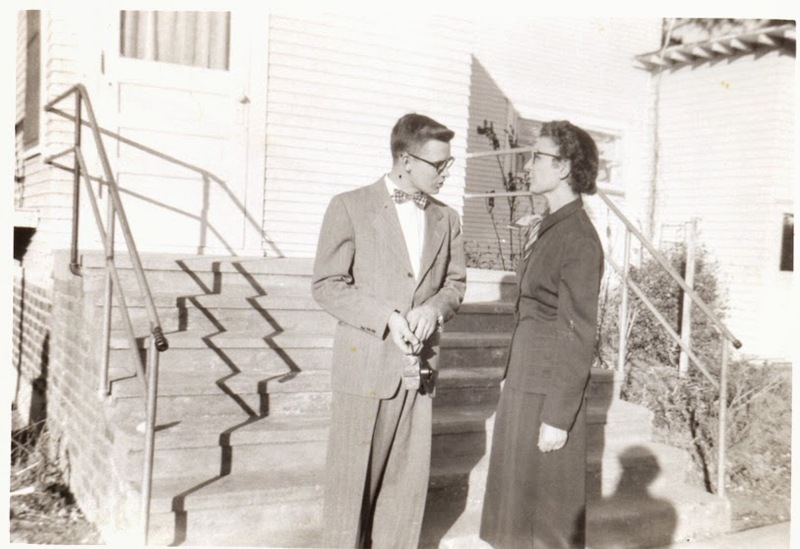 Lillian (Mom) came from her home in Minnesota to work at Grace in 1945 at the recommendation of her pastor. She was almost 21, wasn't anxious to continue college after one year and loved children. It seemed like a good fit. She began working as a cook, but soon was doing what she really loved, caring for the babies and toddlers. 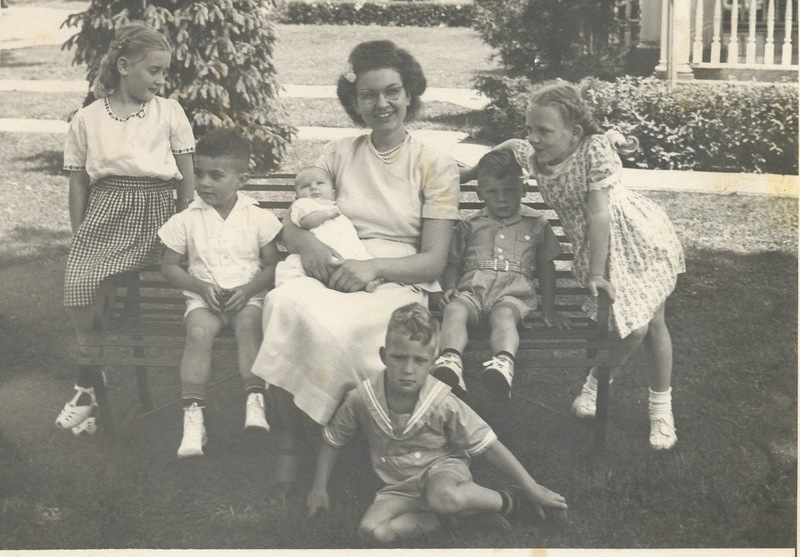 Years passed and she cared for many different children. The monthly salary of $30 plus room and board was meager even for that time. However she once wrote that her years working at Grace were "interesting, fulfilling and as a whole, enjoyable". After working for seven or eight years, she was allowed to take off a year to attend college in another state. During the year that Lillian was gone, Harold (Dad) came to work at Grace. He was completing his 1-W Service. As a Mennonite he did not participate in the military, opting for alternative service. He was assigned to work in bookkeeping. Harold was a Kansas farm boy and a recent college graduate who had one semester of teaching under his belt, something he was sure he did not want to continue. Shortly after his arrival the director of Grace took him aside for a little talk. He knew Harold would meet a number of single women working at Grace. He encouraged him not to eliminate the "older" women from consideration when dating. So when Dad was assigned to pick Mom up from the bus station when she returned from college he followed this advice. Soon they were attending community concerts in the neighboring communities together. 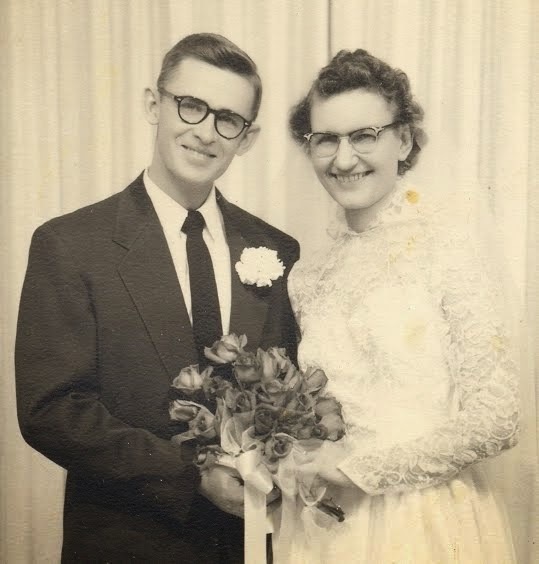 A friendship blossomed into love and in 1954 just a few days after Christmas they were married. 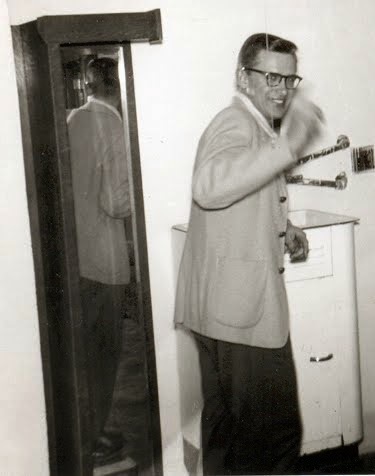 Harold was 24. Lillian was 30. They raised four children in a warm and loving home. Sometimes the topic of their age difference would come up. Harold would always have philosophical answer. "Well, the average women lives about six years longer than the average male and so I figure this should work out about right." Or something like that. It didn't work out that way. Cancer took Lillian in 2000. Shortly before she died she murmured, "I've had a wonderful life". Indeed she had. We kept her recipes and a few of the dishes she used. You'll see the dishes in the recipe photographs. They are treasures, but pale in comparison to the memories we cherish. 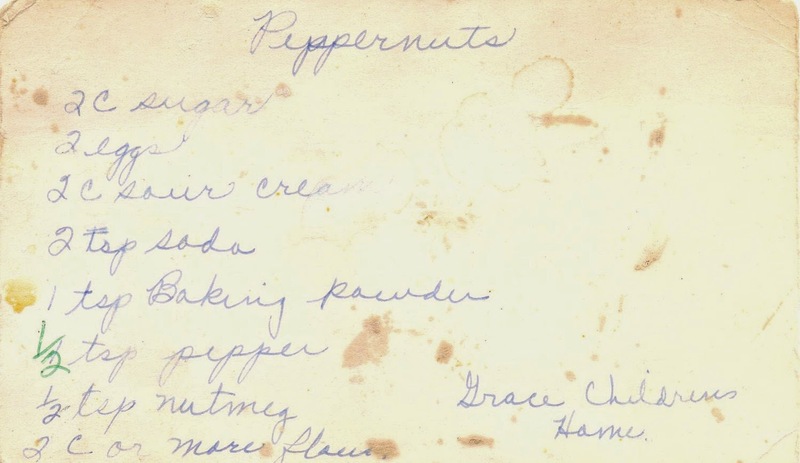 Among the recipes is this one for peppernuts written in her familiar handwriting with ingredients but no instructions and with the notation, "Grace Children's Home". She had halved the amount of black pepper sometime later. 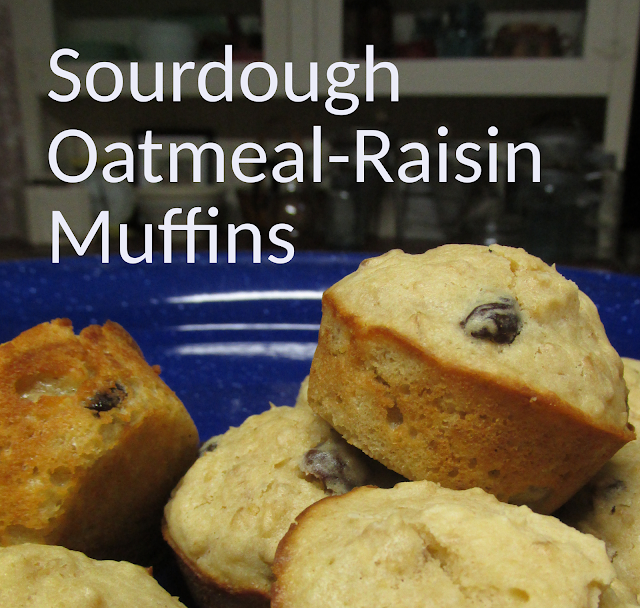 I made a few additional changes to the recipe because it seemed too large for what I needed. The result is a tiny, mild tasting and soft cookie that is best eaten by the handful. Many brides in the 1950s received melamine and pyrex dishes. Cream together sour cream, egg and sugar. In a separate bowl combine flour, soda, baking powder and spices. Slowly add flour mixture to creamed ingredients. Mix well. Add additional flour if needed. Refrigerate or freeze dough. On a floured surface roll portions of dough into "ropes" or "snakes" about 3/8 inch thick. Line up on a plastic wrap lined cookie sheet, cover more plastic wrap and freeze. When ready to bake, preheat oven to 350 degrees and remove several "ropes" from the freezer. Slice into 1/4 inch sections and scatter on a cookie sheet. Bake for 8 minutes or until lightly browned. Repeat with remaining ropes. Peppernuts are traditionally enjoyed during the Christmas holiday season. There are lots of different recipes for peppernuts. Here's one that I often use that includes ground raisins and nuts rather that black pepper. Bev, I absolutely loved this love story. What a wonderful way God has of bringing people together. It's my favorite thing to hear about. Thanks for sharing it. Gary and I make his Grandma's peppernut recipe several times a year. It's a project we enjoy doing together. Hope you have a Merry Christmas! Thanks for your kind words, JoEtta. Peppernuts are a wonderful way to celebrate your heritage and the Christmas season. Merry Christmas to you and yours! It would be interesting to know how many couples can look to Grace Children's Home as having a part in how they met.